"Have you ever tasted a Sparkling Pinotage?" I asked my cyber-pal and pinotage expert, Peter May, author of www.pinotage.org. "Yes' I have", he replied. "The first South African one is a project of the winemaker of Graham Beck wines". "Well I'm going to try a New Zealand one this weekend", I wrote back. "I'll let you know what it is like". Well, Peter, I can tell you that this wine made by Soljans and simply named Sienna, is a little cracker. There was a good 'pop' when the cork was freed from its tight recess. Then, as the wine was poured into flutes the seductive pink froth rose to the occasion. Gently it settled to form a surface of exploding bubbles on the deep crimson, ruby hued liquid. And the bubbles lasted for as long as there was wine in the glass. First the appealing spicy aromas and then, in the mouth, the taste, this richly flavoured wine did not disappoint. Subtle vanillin oak complements flavours of cherry, plum and chocolate with fruitcake spices, a sprinkle of pepper and the merest suggestion of mint. There is a nice earthy complexity and a sweet-fruited finish. Sure it is a little sweeter than the non-sparkling pinotage but the sweetness of this warm, rich wine is not OTT - the savouriness of the pinotage grape makes sure of that. The name Sienna represents the colour of the wine - the richness, the fire, the life. Soljans have been a champion of the pinotage variety for years and years - their best wines coming from Auckland fruit (I have not been overly impressed with their Gisborne-sourced pinotage, however). So I was not surprised to find that the base wine came from Auckland pinotage grapes grown in the very good 1998 red wine vintage. The wine was fermented and matured in the bottle for 3 years before disgorging and dosage. Tony Soljan made this Methode Traditionelle wine at his former Henderson winery*. Here he had the state-of-the-art 'methode' equipment used to process the wine from the introduction of the secondary fermentation additives to the bottling line. He used to process the bubblies of other producers as well as his own. With sparkling reds increasing in popularity across the ditch (ie. in Australia), he thought "I'll give this a go too". 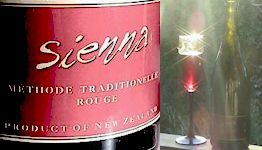 Sienna is definitely as good as a $50 bottle of sparking red from across the ditch but at a third to quarter of the price, depending where you buy. If you are in Auckland, head out to the new Soljans winery at 266 State Highway 16, Kumeu. This new winery opened to the public in July 2002 and for an opening special, the 'Sienna' is just $11.95 a bottle, down from an RRP of $17.95. I ordered half a dozen. Soljans recommend serving Sienna alongside a dessert such as a dark rich chocolate cake served with a raspberry coulis. However I tried the wine with a piece of fruitcake and this was a good match too. And I reckon for those of us 'down under', enjoying those mid-winter Xmas dinners as we tend to do at this time of the year, this wine will be a suitable accompaniment to a main course of Turkey or even with the Xmas pud. *Soljans Estate has a new winery at 366 State Highway 16, Kumeu, which opened in July 2002. The site of the old winery in the increasingly busy and now industrialised Lincoln Road (in Henderson) where Soljans was first established 70 years ago has been sold. "The winery was under siege for years", said Tony Soljan. The Methode production facilities have been moved to Morton Estate. Soljans have a website at www.soljans.co.nz. This lists contact details and export markets.